Comprehensive tax reform has gotten a jump-start from Senators Max Baucus (D-MT) and Orrin Hatch (R-UT), the chairman and ranking Republican on the Senate Finance Committee. The Senate’s two top tax writers announced a new “blank slate” approach to tax reform in a “Dear Colleague” letter issued last week. We plan to operate from an assumption that all special provisions are out unless there is clear evidence that they: (1) help grow the economy, (2) make the tax code fairer, or (3) effectively promote other important policy objectives. This plan has drawn both praise and criticism, and rightly so. Yes, this is a step in the right direction; however, this is unlikely to lead to any sustainable reforms for two reasons. First, forcing Congress to defend tax privileges won’t be hard. To become law, each privilege had a sponsor, and each sponsor had a rationale to defend it. Each tax privilege was passed by Congress, and each was then signed into law. It is difficult to see how privileges that have already survived this process won’t once again find a congressman willing to defend them. So long as Congress has the power to create and protect tax privileges, it will be nearly impossible to simply wipe such privileges away. Second, even if a blank slate were achieved, it is unlikely that a privilege-free tax code would last long under the current institutional framework. This is best demonstrated by what happened in the aftermath of the Tax Reform Act of 1986 (TRA86). Buchanan was spot on. From 1986 through 2005, the tax reform of 1986 suffered a death of 15,000 tweaks. As reported by the President’s Advisory Panel on Federal Tax Reform in 2005, in the two decades after the 1986 tax reform bill was passed, nearly 15,000 changes were made to the tax code – equal to more than two changes per day for 19 years straight. The 1986 broadening of the tax base by closing several established loopholes and shelters offers potential rents to those agents who can promise to renegotiate the package, piecemeal, in subsequent rounds of the tax game. The special interest lobbyists, whose clients suffered capital value losses in the 1986 exercise, may find their personal opportunities widened after 1986, as legislators seek out personal and private rents by offering to narrow the tax base again. In one fell swoop, the political agents may have created for themselves the potential for substantially increased rents. This rent-seeking hypothesis will clearly be tested by the fiscal politics of the post-1986 years. Going forward, if any sort of reforms are achieved in the tax code, this rent-seeking hypothesis will be tested again. Senators Baucus and Hatch admit that a blank state “is not, of course, the end product, nor the end of the discussion.” If Buchanan’s predictions remain true today, as they most certainly are, then the Senators are quite right in admitting that a blank slate is not, and will never be, an end product. That is, of course, unless any reform in the tax code is paired with institutional reforms to ensure that special tax privileges do not creep back into the code. This entry was posted in Public Choice, Study of American Capitalism, Tax and Budget and tagged Dear Colleague, economy, James Buchanan, make, Public Choice, reform, tax, tax reform, Tax Reform Act on July 3, 2013 by Christopher Koopman. A search of the Code conducted in the course of preparing this report turned up 3.7 million words. A 2001 study published by the Joint Committee on Taxation put the number of words in the Code at that time at 1,395,000. A 2005 report by a tax research organization put the number of words at 2.1 million, and notably, found that the number of words in the Code has more than tripled since 1975. The American people deserve a tax code that helps small businesses spend less time filling out complicated forms, and more time expanding and hiring; a tax code that ensures billionaires with high-powered accountants can’t pay a lower rate than their hard-working secretaries. Through tax credits, grants, and better loans, we have made college more affordable for millions of students and families over the last few years. We’ll give new tax credits to businesses that hire and invest. The tax code didn’t get to be as complicated as it is by accident. Every complication; every loophole; every deduction, exemption, and credit got there because some elected official had a clever idea. It got there because someone dreamed up an innovative scheme to use the tax code as a way to encourage some sort of behavior. The code is the way it is because politicians who decry loopholes and special-interest privileges can’t see that their own clever schemes are part of the problem. This entry was posted in Government-Granted Privilege, Tax and Budget and tagged Federal Tax Code, growth, make, President Obama, reform, research, tax, tax reform on February 13, 2013 by Matt Mitchell. A new policy brief released by the Mercatus Center and co-authored by Jeremy Horpedahl and Harrison Searles analyzes one of the most popular—and therefore one of the most difficult to reform—subsidies in the tax code: the home mortgage interest deduction. This study touches on many of the points that Emily talked about in her op-ed on the subject last month; namely, this policy’s failure to achieve its intended effects and the fact that a lion’s share of the benefits go to high-income homeowners. Despite widespread enthusiasm for the home mortgage interest deduction, the authors argue that the benefits of this policy are overstated and the consequences are understated. Empirical evidence supports the claim that the mortgage interest deduction has little effect on homeownership rates in the United States. Between 1960 and 1997, homeownership rates stayed within a narrow range of 62 to 66 percent, despite the fact that the implicit tax subsidy fluctuated dramatically. During the recent housing bubble, the homeownership rate rose to 69 percent, but it has since returned to the historical range. This rise appears to have been unrelated to the mortgage interest deduction, though it was almost certainly related to other housing policies that encouraged the bubble. More sophisticated analysis suggests that the homeownership rate would be modestly lower without the deduction, by around 0.4 percent. Ironically, the home mortgage interest deduction likely creates the perverse effect of discouraging homeownership by artificially raising home values. Economic intuition suggests, and empirical studies have supported, that the deduction does not provide much in the way of savings at all since the value of the deduction is simply capitalized into the value of home prices. The artificially higher house prices prevent would-be home owners on the margins of affordability from purchasing a home within their price range. This effect, combined with the low rates of deduction claims and concentration of benefits to high-income earners, likely contributes to the inefficacy of the home mortgage interest deduction to boost homeownership to the degree that its proponents envisioned. Additionally, countries like Canada and Australia have managed to produce comparable rates of home ownership as the US without the crutch of a mortgage interest deduction. While the home mortgage interest deduction doesn’t do much for increasing the number of houses, it has a knack for increasing the size of houses, as a study by Lori Taylor of the Federal Reserve Bank of Dallas pointed out. The deduction has had the unintended consequence of directing capital and labor to high-income residential housing projects that might not have been taken without government intervention—and the benefits overwhelmingly go to the wealthy. This is all before considering the regressive effects of the policy by design: low- and middle-income renters are made to subsidize the increasingly opulent residences (and sometimes the extra vacation homes!) of their more well-off peers while they struggle to make ends meet in a sometimes-inhospitable economy. This injustice, combined with the inefficacy of the tax deduction to increase homeownership in any meaningful way, causes the justifications for the mortgage interest deduction to grow scarce. In fact, it is becoming increasingly clear that this policy, which evaded the fate of its similar counterpart—the credit card interest deduction—during the tax fight of 1986, continues as law not because of good economics but because of bad political incentives. 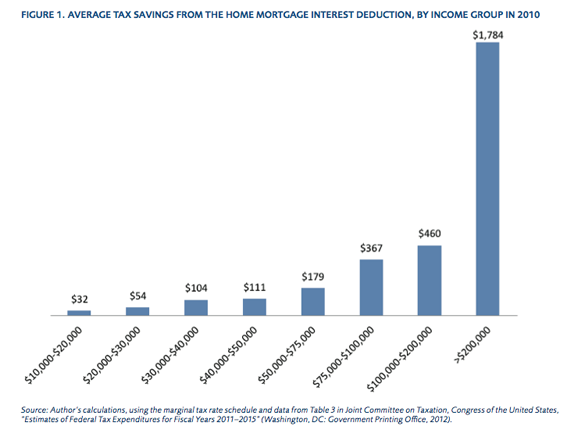 Horpedahl and Searles offer three proposals for scaling back the home mortgage interest deduction: policymakers could 1) eliminate the deduction entirely, 2) eliminate the deduction while simultaneously lowering marginal income tax rates to compensate for the virtual tax increase, or 3) stop the deduction and replace it with a tax credit that taxpayers could redeem upon purchase of their first house. Horpedahl and Searles demonstrate that while this deduction is popular with the public and the real estate industry, it is simply a bad deal for most taxpayers. This entry was posted in Economic Policy, New Publications, New Research, Public Finance, Tax and Budget and tagged home mortgage interest deduction, home ownership, housing markets, Mercatus Center, New Research, tax, tax expenditures, tax reform on January 8, 2013 by Andrea Castillo.